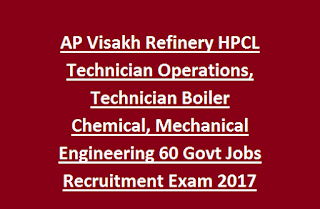 qualified Diploma in Chemical Engineering or Mechanical Engineer they are eligible to apply for this HPCL jobs of Technician Operations, Technician Boiler Vacancies. Those who are having Higher qualifications they are not eligible to apply for this HPCL Technician Jobs. Interested candidates can submit their application form online through official website of HPCL @www.hindustanpetroleum.com on or before 08-June-2017. There are total 60 Technician Jobs available in this HPCL Recruitment 2017. For Selection for this HPCL Technician jobs will be based on Computer Based Exam or through written Exam. For more details regarding HPCL Technician Operations, Technician Boiler jobs see the below given information. 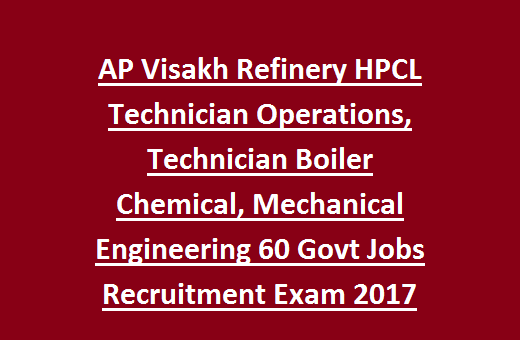 There are total 60 Technician Jobs available in this Hindustan Petroleum Corporation Ltd Visakha Refinary of Andhra Pradesh. As as on 01-May-2017 candidates age limits are 18-25 years and for SC/ST 5 years, for OBC 3 years of upper age relaxation is given. Monthly consolidate salary will Rs.40000/- for this HPCL technician Jobs. Selection for this HPCL Technician Jobs will be based written exam or computer based exam. Based on cut off marks in Written exam or CBT candidates will be called for Skill Test. This skill test just qualifying purpose only. Finally medical test will be conducted for selected candidates. Written test comprises of the topics General Aptitude Test and Technical / Professional Knowledge. Technical knowledge will be respective Engineering subject of candidate qualified in Diploma. Eligible candidate may login to the official website of www.hindustanpetroleum.com. Click on career opportunities section and then find the Technician Jobs recruitment link and submit the application form.